creating or retaining 150 jobs to support strong demand for an all-new second-generation 3.5-liter EcoBoost® engine family for the 2017 Ford F-150 lineup. The investment in second-generation EcoBoost engine technology is part of the $9 billion commitment the company made in the 2015 Ford-UAW collective bargaining agreement to invest in its U.S. plants. Ford, which has 80,000 U.S. employees, is committed to creating or securing 8,500 hourly jobs in communities across Michigan, Illinois, Kentucky, Missouri, New York and Ohio over the next four years. Since 2011, Ford has invested more than $10.2 billion in its plants across the United States. 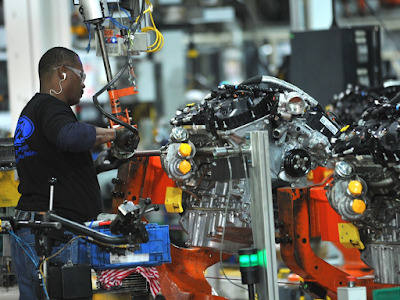 Cleveland Engine Plant produces the current version of the 3.5-liter EcoBoost engine, which powers 2016 Ford F-150, Explorer, Expedition, Transit, Flex and Taurus. In addition to the 3.5-liter EcoBoost engine that has been a success throughout the F-150 lineup, the 2017 Ford F-150 Raptor will be powered by Ford’s all-new second-generation, high-output 3.5-liter EcoBoost that produces more power with greater efficiency than the previous 6.2-liter V8. The high-output 3.5-liter EcoBoost is a Raptor-exclusive in the F-150 lineup, paired with an all-new 10-speed transmission for improved efficiency. As the cornerstone of Ford’s global engine strategy to reduce fuel consumption and emissions, EcoBoost engines, introduced in 2009, deliver the same capability as larger-displacement engines, with significantly better fuel economy. EcoBoost uses smaller overall engine size combined with turbocharging, gasoline direct injection and variable valve timing to provide customers the power they want and the fuel economy they need. Cleveland Engine Plant opened in 1951 and employs more than 1,500 people. It has produced more than 1 million EcoBoost engines since 2009. Along with the current 3.5-liter EcoBoost for F-150, the plant builds the 2.0-liter EcoBoost for Edge, the 2.3-liter EcoBoost for Explorer, Mustang and Lincoln MKC, as well as the 3.7-liter V6 rear-wheel-drive application for Mustang. The all-new 2017 F-150 Raptor is the toughest, smartest, most capable Raptor ever. It features an all-new purpose-built, high-strength steel frame unique to Raptor, plus a high-strength, military-grade, aluminum-alloy body that helps save more than 500 pounds versus the previous version for improved off-road performance and capability. Larger FOX Racing Shox have more suspension travel, plus all-new terrain management technology and the availability of redesigned industry-exclusive beadlock-capable wheels that increase grip in low-traction conditions help F-150 Raptor tackle North America’s toughest trails. F-150 Raptor will be built at Dearborn Truck Plant. The new truck goes on sale in the United States and Canada this fall.